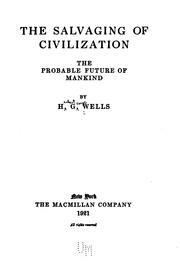 Apart from science fiction novels, Wells wrote other genre novels’, which we could call “social novels”, in which he expressed what he thought about politics; among those is The Salvaging of civilisation, written in 1921. Part of Salvaging of civilisation was a book written as a group of conferences that had to be pronounced in the USA and Canada. “These speeches were planned broadly speaking and express his idea of what is necessary to do if we want to rebuild and save out civilisation from the ruin and decadence in which it is also actually summing. The whole novel plot is a complete program of propaganda and politic and educational reconstruction, which can be extended all around the world”, these were some of Wells’ words as the prologue of the novel. “A Worldwide State project”, was written at the beginning as a conference to be pronounced in the United States. He explained in his first words of the text that the first title he chose for that first chapter was “A Worldwide State utopia”, but he thinks “there is something insubstantial and vague in that utopia word. Most people think at it as an ethical dream and high politics, pleasant and edifying”, that means that most people think it is unachievable, but he wanted the society to achieve a world politically united, of a world permanently and safely in peace; a real and possible world, utopian as for the rest of the people minds’, but not for him. Most Americans thought that a “global state” could only be brought about through military conquest. However, in Salvaging Civilization, H.G. Wells suggests how this planetary political organization could be brought about through education and the management of public opinion. Wells assumed that the future of mankind depended on the establishment of a world unity to protect the human beings from social and physical destruction. He tried to make believe the society, that only being together was possible to success on his “utopia”. He became something such a prophet, like Jules Verne, he predicted in some of his writings things as the aerial bombing, nuclear wars, in The War of the Worlds, he predicted gas warfare, laser-like weapons, and industrial robots. His science fiction novels are almost uniformly pessimistic about human nature and the future in general, although Wells became famous as a socialist and utopian. His biggest tragedy was that his most successful predictions were of destructive technologies, and he lived to experience the opening of the “atomic age” in the Second World War.